Does the Book of Mormon, the sacred text of the Mormon Church, owe its existence to Nathaniel Woods, leader of an unusual Vermont religious sect founded in 1789? Some historians see a connection. The story of Nathaniel Woods and his unconventional religious beliefs reached its climax on January 14, 1802. 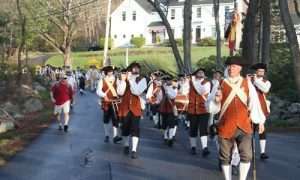 On that night the town of Middletown, Vt. (now Middletown Springs) summoned up its militia. The enemy? The expected arrival of a “destroying angel” who was about to attack the town. Woods had prophesized the attack, and he held enough sway in town that some in town were concerned. Others were terrified. 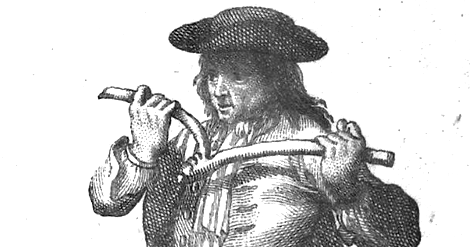 Illustration of a man using a divining rod. Laban Clark, who would one day become founder of Wesleyan University, recalled the night. Clark was a traveling Methodist Minister in town as a missionary. After preaching, he was told of the unusual activities of a religious group that called themselves the Modern Israelites. They were known by the town as simply the Rodsmen. Clark spent a sleepless night in a schoolroom with a group of nervous Middletown citizens who were awaiting an earthquake or some other apocalyptic event signaling that the end of the world was at hand. Other than some crockery that was found broken, there was no sign of the destroying angel that Woods had warned of. Did Clark witness in the Rodsmen's adventures the inspiration for the Mormon religion? The Rodsmen were a loosely affiliated group of area residents who had begun following the teachings of Nathaniel Woods. Woods had been a member of the Congregational Church until he was expelled. Most histories say his expulsion in 1789 was not over any theological differences with the church, but because of his combative nature. When he was denied the post of minister in the church he apparently became so obnoxious and confrontational the church fathers kicked him out. The action did nothing to tame Woods. Rather it inspired him to establish his own congregation. At first his church consisted of family members, but eventually grew to a flock of 30. Woods' beliefs began evolving in a rather unusual direction. He began to believe that he could use a divining rod for a number of mystical purposes. Woods told his followers that the rods could be used to find gold that had been gathered up into clumps underground to bring wealth to true Christians. On a number of occasions he and his followers would find a spot they believed contained gold and dig holes in the ground – sometimes as as deep as 70 feet. Always they were disappointed. Woods saw the failures as a sign that his followers needed to strengthen their faith. If just one doubting sinner was among a crew of diggers, the almighty would move the gold. And so Woods and his followers were never able to find their treasure. Woods's use of the divining rods evolved and he began telling his followers that they were the Biblical Lost Tribe of Israel. The rods, he said, could be used to tell if someone were Jewish. Eventually, he said, the tribe would be ushered to heaven in the end-of-the-world scenario. Woods was hardly the only religious leader to predict the end of the world, which many tied to the coming coming new century. He and his followers practiced various scenarios where they would seek shelter in certain homes so that they could be protected from the destroying angels who would slaughter and terrorize the faithless. Eventually Woods identified January 14, 1802 as the date the destruction would kick off. As word spread of Woods' prediction, his neighbors grew worried. Their concern wasn't just about the end of the world. They were also concerned that Woods and his followers would create mayhem. Townspeople called out the militia, whose members stood sentry throughout the night and kept the peace. Woods and his New Israelites soon decided it was time to move on from Middletown, and they relocated to Palmyra, New York. The story of the incident, known as the “Woods Scrape,” might have died there along with a multitude of other small religious sects had not historians begun looking for a connection between Woods and the Mormons. The Church of Latter Day Saints, commonly known as the Mormon Church, was founded on a discovery in upstate New York by Joseph Smith of some golden plates on which were inscribed some religious teachings. Smith dug the plates out of the ground in 1823 after several years of seeking them out. Smith was given the power to translate the messages the gold plates contained. After that he returned the plates to an angel, and they've never been seen again. What he translated became the Book of Mormon. Some of the teachings of Woods' church are in line with Mormon teachings, Joseph Smith was, like Woods, a money digger. And two of the founders of Mormonism lived in close proximity to Woods at the time he was leading the New Israelites. It's been suggested that Joseph Smith's father was a member of Woods' flock and that his religious teachings – including the digging up of gold – was lifted straight from Woods' New Israelite playbook. From there, there is little to go on but speculation. Skeptics about the connection suggest that it is suggested simply as a means to cast doubt on Smith, as Woods' followers were not the most upstanding people. Nevertheless, Rev. Clark believed that the Woods scrape was at the root of the Mormon Church. “By what I learned of them, I have no doubt that their movement gave origin to the Mormons,” he wrote. Thanks to: Joseph Smith and the Origins of The Book of Mormon, 2d ed. By David Persuitte and The History of Middletown, Vermont, by Barnes Frisbie. Give it up. You’ll never prove the Book of Mormon false. Noone has, because it’s true.